Planet Of The Apes slot machine is the long awaiting new title from NetEnt in association with 20th Century Fox, that is based on the Rise Of The Planet of the Apes and Dawn Of The Planet Of The Apes films. The mobile slot features two game areas called Rise and Dawn, and there are in incredible 5 bonus features. One of the bonus features is random, two are triggered by symbols being on either end of the gameboards and two are free spins features, which when combined can reward players with unlimited free spins. All the info is in the full Planet Of The Apes slot review below. Undoubtedly one of the most anticipated video slot releases of 2017, the brand new Planet Of The Apes slot from the NetEnt slots team has just swung in on the jungle vine to take over a mobile casino site near you. Based around the two films The Rise Of The Planet Of The Apes and The Dawn Of The Planet Of The Apes, the game is split into two halves in an unusual 10-reel, 40-payline format. That means a separate set of high value symbols appears on each half of the gameboard, though should players land a full stack of wild symbols on one side, it will transfer to the other in a bid to create multiple payline wins. Featuring state of the art graphics, breath-taking sound and genuine clips from the two movies, the Planet Of The Apes slot machine can be played from as little as £0.20 per spin across all desktop, mobile and tablet devices. The game features a regular jackpot of 1,000x players’ bet per line amount, but the presence of five separate bonus features makes it an action-packed adventure that frequently pays out even more. Of the five features, one is activated at random, two are launched by a special symbol appearing on reels five or 10 and two are free spins features that are triggered by landing three or more scatter symbols on either of the gameboards. Dealing with them in order, the random Dual Feature selects two symbols at random and freezes all instances of them in place before a free respin gets underway. Next up you have the Rise and Dawn bonuses on the left and right reel sets respectively. The first sees every human or ape symbol displayed at the end of the triggering spin issue an instant cash payout, while the second transforms all human or ape symbols into one random icon to create multiple wins. The free spins features, meanwhile, are played out in much the same way, with the Rise Free Spins storing up every wild symbol players land before they are all spat back onto the board for a final spin. Our personal favourite, however, is the Dawn Free Spins, as here players will have the chance to collect special symbols that fill up power metres and trigger additional spins, prize multipliers and extra wilds. 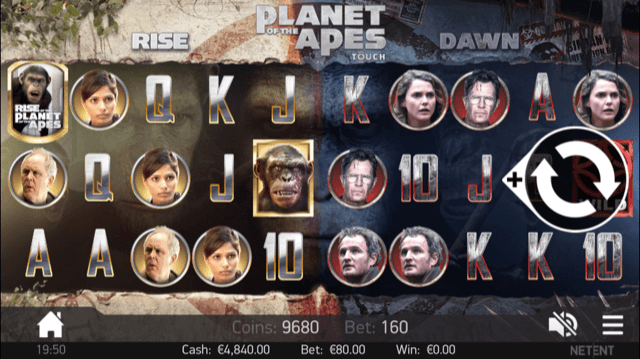 Given its big billing, we expected to be impressed by NetEnt’s Planet Of The Apes slot – and we weren’t disappointed. The game is visually superb and boasts plenty of features for you to sink your teeth into. Like the Planet Of The Apes slot review? Check out these as well…..